While introducing us to organics, Newman’s Own has introduced us to giving. 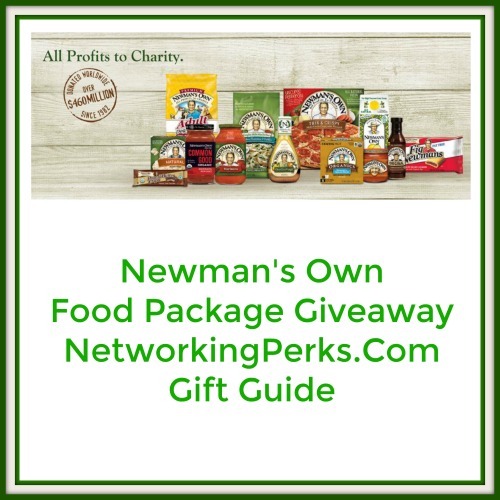 Newman’s Own, Inc. is committed to paying all profits and royalties from their food products to the Newman’s Own Foundation, which supports charitable causes around the world. Newman’s Own carries a huge variety of foods that you can stock your pantry with. Dressings, sauces, snacks, oils and vinegars, and so much more. When stocking your pantry with Newman’s Own you know that you are getting quality, organic foods and are helping to give back at the same time. Take a moment and look at Newman’s Own website and see what you’ve been missing. Who would have thought that bottling salad dressing in old wine bottles to give as gifts would evolve into a business. This was the genesis for Newman’s Own Organics when Paul Newman set out over 30 years ago to bring all-natural, quality foods to the world. Plus passing on the profits to those who needed the help the most. Would you have guessed that Newman’s Own Organics would evolve past the grocery aisles and into the pet aisle? Who says that quality, all-natural, organic foods should only be for humans. Newman’s Own Organics has an entire line of pet food products for the wellness and care of our furry family. 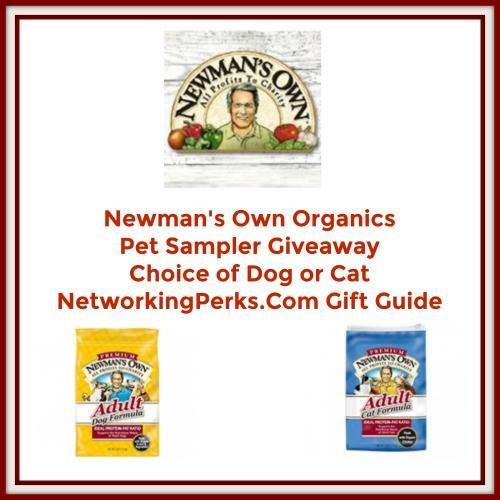 Newman’s Own Organics has foods and treats made from a unique blend of proteins, whole grains, vitamins and minerals. Ingredients are carefully selected for all life stages of your pet. From canned food to dry food, snacks and treats, Newman’s Own Organics offers a wide variety of high quality, all natural ingredients for your dog or cat. Celebrate the holidays this year with the rich taste of the Southwest by savoring gourmet, traditional Mexican fare from Tucson Tamale. Made in the traditional method with warm masa, gentle corn husks, and a bouquet of flavors. Spending hours together, embracing the connectedness of family, infusing all the love right into the food. Inspired by the events of one man’s love for a woman whose family had a love and passion for bringing family together by making tamales. Todd Martin was not only in love with his soon to be wife Sherry, but he also fell in love with the taste and process of making tamales. Trying to satisfy his desire to find really good tamales Todd Martin did what others do, he began making his own! In 2008, the Tucson Tamale company was born. Made from small batch, high quality ingredients and every tamale is hand rolled, steamed and packaged for happiness. 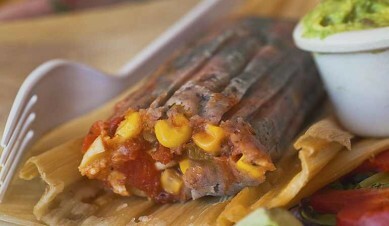 The corn used in the masa is organic and non-GMO. 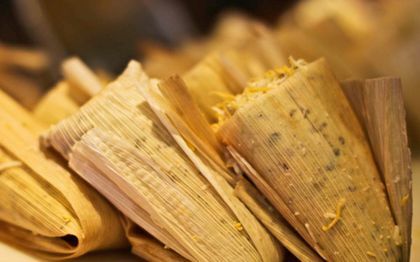 Traditional tamales are made with lard but Tucson Tamale knew they were different and wanted to continue on their unique path and use non-GMO expeller pressed canola or sunflower oil. 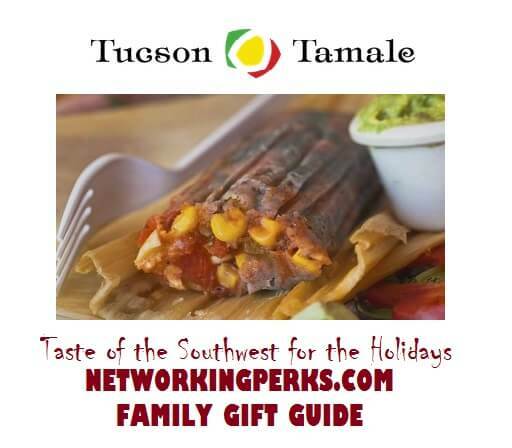 Every November Tucson Tamale makes their signature “holiday” tamale for Thanksgiving. Stuffed with fresh roasted turkey, organic vegetables and the amazing sage masa. Naturally gluten free and since the tamales are not made with lard, vegetarians, meat lovers and even vegans can enjoy the wide variety of meatless and meaty tamales delivered right to your door. If you are in Arizona, you can find these tasty delicacies at AJ’s Fine Foods, Safeway or visit one of their three locations in Tucson. Eat in or take out! Take some home to enjoy for later, they are safe to store in the freezer. For those of you not in Arizona or the immediate area to Tucson we are happy to share this wonderful giveaway for a sampler pack of a box of happiness with Tucson Tamales. The cold weather is coming if it hasn’t already hit you and there is nothing more soothing then a hot cup of tea. 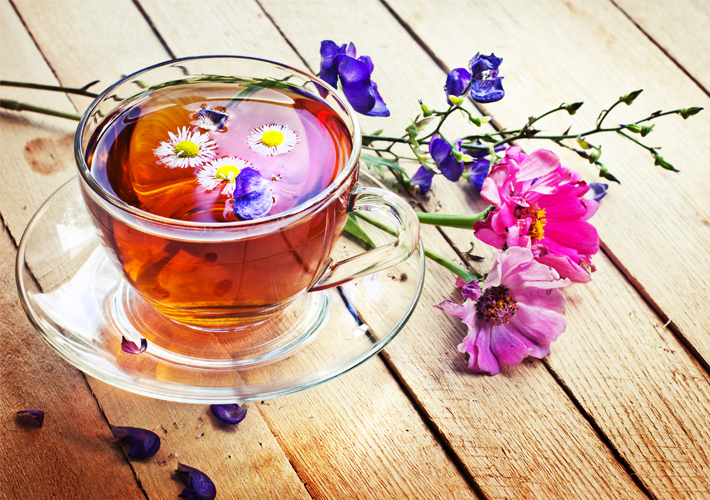 Tea Gallerie can help with teas that can help make you healthier, as well as providing exciting choices. They give you the opportunity to stop and enjoy a cup of tea that promotes giving back to the community. Tea Gallerie wants to provide teas that give a complete sensory experience. Tea is delicate and sensitve yet versatile and unique, just like each of their customers. Disclosure: The bloggers participating in this event have NOT been compensated for this post. Networking Perks provides honest opinions, beliefs or experiences on products reviewed. Networking Perks is NOT responsible for prize fulfillment, Tea Gallerie will be sending the prize directly to the winner. This event is in no way associated with, sponsored, administered, or endorsed by Twitter, Google, Pinterest, Facebook or any other social media. If you have any questions or would like help in promoting your own product please contact me at Joie@NetworkingPerks.com . The disclosure is done in accordance with the Federal Trade Commission 10 CFR, Part 255 Guides concerning the use of Endorsements and Testimonials in Advertising. Tea has been a staple in homes for hundreds of years. Not only does it taste good but it contains health benefits as well. Honest Tea Company strives to be the leader in the tea industry by setting a good and honest example. Honest Tea comes in many delicious flavors but their new teas Cinnamon Sunrise and Ginger Oasis are new and different to the taste buds. The Cinnamon Sunrise is an herbal tea, unsweetened with a brew of rooibos, cinnamon and ginger root. The Ginger Oasis is also an unsweetened herbal tea, with a brew of rooibox, ginger root and Egyptian lemongrass. These two delicious teas have a lot in common, both are USDA Organic, come in glass bottles are recyclable, are Gluten Free, contain no GMOs and are a delicious way to quench your thirst ANNNNND? Are 0 Calories. Disclosure: The bloggers participating in this event have NOT been compensated for this post. Networking Perks provides honest opinions, beliefs or experiences on products reviewed. Networking Perks is NOT responsible for prize fulfillment, Honest Tea will be sending the prize directly to the winner. This event is in no way associated with, sponsored, administered, or endorsed by Twitter, Google, Pinterest, Facebook or any other social media. If you have any questions or would like help in promoting your own product please contact me at Joie@NetworkingPerks.com . The disclosure is done in accordance with the Federal Trade Commission 10 CFR, Part 255 Guides concerning the use of Endorsements and Testimonials in Advertising. 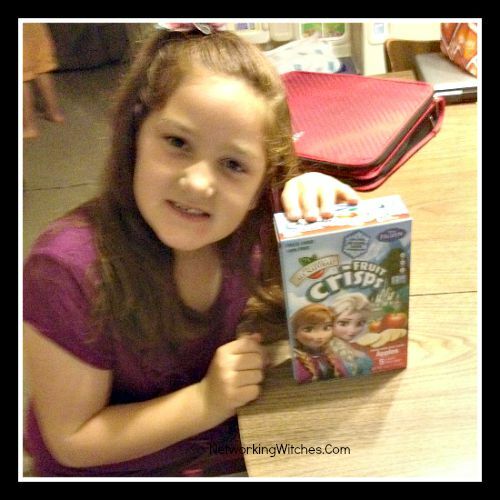 Frozen is a movie near and dear to my heart and All Brothers Natural have combined Frozen Packaging with their Fruit Crisps. Are you a family trying to eat better, eat a more balanced diet? We are, and having snacks that we can grab and go are important to us. Everyone loves these individually prepackaged snacks at our house and since they don’t have to be refrigerated they are perfect to keep in the car as a before/after swim practice snack. Grab and take to football, and even instead of potato chips in the kids lunches. These have just the right amount of crunch and natural sweetness to stave off hunger pains and curb that sweet tooth. Someone used their magical powers to freeze dry these apples and turn them from regular, ordinary apples to special, take with you anywhere, eat anytime apples! Ready for building a snowman, playing dress up, or building your very own ice castle, these are the perfect snack for the princess on the move! Don’t hide these special snacks away – share them with everyone you love. Let go of all the added sugars and hard-to-pronounce ingredients in other snacks. Coming in packages with 40 bags, there’s always enough to share with a little (or big!) sister and new friends you meet on all your adventures! 100% real, sliced Apples with the water gently removed. 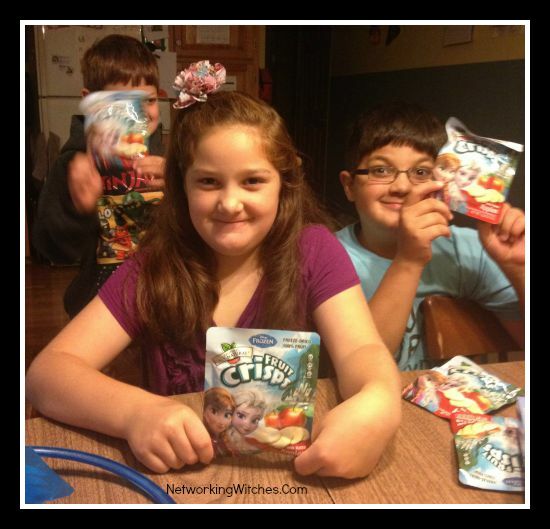 Freeze-dried Apple Fruit Crisps are a healthy snack for you and your little ones. Disclosure: The bloggers participating in this event have NOT been compensated for this post. Networking Perks provides honest opinions, beliefs or experiences on products reviewed. Networking Perks is NOT responsible for prize fulfillment, Brothers All Natural will be sending the prize directly to the winner. This event is in no way associated with, sponsored, administered, or endorsed by Twitter, Google, Pinterest, Facebook or any other social media. If you have any questions or would like help in promoting your own product please contact me at Joie@NetworkingPerks.com . The disclosure is done in accordance with the Federal Trade Commission 10 CFR, Part 255 Guides concerning the use of Endorsements and Testimonials in Advertising. Holiday Contest and Sweeps is honored to team up with one of my great sponsors Ergo Chef to bring you a terrific giveaway called the”Christmas In July” Giveaway.The winner will receive a 15 Piece Prodigy and Pro Series Set of Cutlery that is second to none when it comes to quality and craftsmanship. This 15pc. 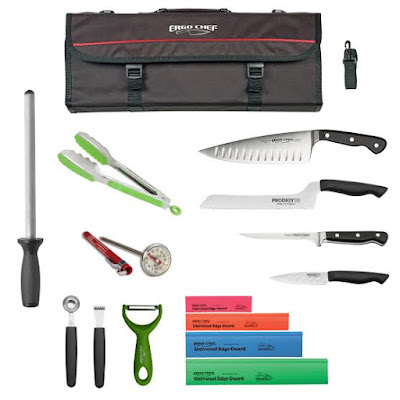 knife Kit includes the following highly rated Pro-Series Forged Knives – 8″ Chef knife with hollow grounds and a 5.5″ Medium Flex Boning knife. The stamped knives include the PRODIGY Series 8″ Offset Bread knife, & 4″ Paring knife both with TPR non-slip grip handles and full tang inside handle for a professional balanced feel & durability. All knives are ground to 18 degree edges and heat treated for long edge life. Kit also includes 10″ Diamond Sharpener, 9″ Duo Tongs great for a flat top or stove top grill. Melon Baller, Peeler & Zester, a 1″ Dial Meat Thermometer, edge guards for the knives and a 13 pocket hard panel bag & shoulder strap, with inside zipper cover to safely contain all the knives while in transit. Pro Series , Prodigy Series , Michael Symon Series , Tony Luke and much much more. at 12:00 AM (EST) 8/18/15. Holiday Contest and Sweeps did not received any form of compensation for this giveaway. Ergo Chef will be responsible for awarding and shipping the prize directly to the winner. a amazing 3 piece knife set that one lucky winner will win. take a look at this terrific set of knifes. 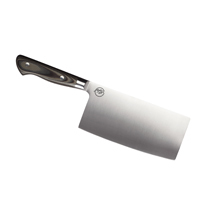 This 9 inch Chef Knife was designed with Chef Michael Symon and is known as the main workhorse in the chefs’ kitchen. It’s a must have for chopping veggies to slicing chicken and proteins. The sturdy blade is .090 inches thick by 1.9 inches wide by 9 inches long allowing you to cut very large foods with ease. This knife is crafted per my specifications from high carbon German Stainless steel for durability and one of the world’s best handle materials G10 fiberglass resin which will withstand the toughest kitchen environment. The handle is .725 inches thick by 1.050 inches wide in the middle by 5.1 inches long including the bolster. Two polished rivets in the handle complete the look. The blade is precision tapered with a smooth high polish finish for beauty and less food stick. The edge is ground to 18 degrees for easy chopping and rocking through all fruits and vegetables and meat. We make sure each knife is heat treated to the best hardness ensuring long edge life and easy maintenance for both the busy chef and home cook. 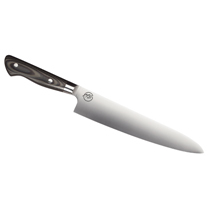 This Chef Knife will be one that will give you years upon years of quality use every day. when it comes top cleavers. This 6 Inch Serrated Utility Knife was designed with Chef Michael Symon for slicing bread, bagels, and tougher skinned vegetables. A must have for every kitchen. The sturdy blade is .090 inch thick by 1.2 inch wide by 6 inch long allowing you to slice smoothly through tough crusts or soft fresh loafs straight out of the oven. 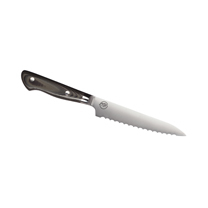 The wide serrations produce very little crumbs and can even thinly slice meat without tearing. This knife is crafted per my specifications from high carbon German Stainless steel for durability and one of the world’s best handle materials G10 fiberglass resin which will withstand the toughest kitchen environment. The handle is .725 inches thick by .980 inches wide in the middle by 4.8 inches long including the bolster. Two polished rivets in the handle complete the look. The blade is precision tapered with a smooth high polish finish for beauty and less food stick. We make sure each knife is heat treated to the best hardness ensuring long edge life and easy maintenance for both the busy chef and home cook. We cut no corners by manufacturing and inspecting each knife to our high quality standards we know you’ll enjoy during each use. may be using now as you will quickly find out they are no match to this Utility Knife. I have a son that is addicted to tea. He loves every type and kind and even ordered a special tea set just to brew this tea. He loves the tea and says it’s one of the best he’s ever tasted. Each flavor of tea comes in its own little labeled tin container. It came boxed in a beautiful box ready to keep for yourself or give as a gift. This is the perfect tea sampler for people who want to try Enjoying Tea’s top selling tea at an affordable price. This Tea Sampler includes 8 samples of their Top Selling teas. You will get between 0.75oz and 1.5oz per sample, depending on the leaf size of the tea. Each tea each will come in its own square tin canister, which will all be housed in a presentable, decorative box. This Sampler Set is perfect for gift giving. Disclosure: The bloggers participating in this event have NOT been compensated for this post. Networking Witches provides honest opinions, beliefs or experiences on products reviewed. Networking Witches is not responsible for prize fulfillment; The Enjoying Tea Company will be responsible for prize fulfillment. This event is in no way associated with, sponsored, administered, or endorsed by Twitter, Google, Pinterest or any other social media. If you have any questions or would like help in promoting your own product please contact me at WinterWitch@NetworkingWitches.com . The disclosure is done in accordance with the Federal Trade Commission 10 CFR, Part 255 Guides concerning the use of Endorsements and Testimonials in Advertising.